Four BC curling teams have successfully secured performance incentive funding from Curl BC. The top two adult teams from each gender who signed up for the Tier 1 and Tier 1A High Performance Program were all eligible to receive the funding – but only if they were successful in achieving a certain ranking on the Canadian Team Ranking System (CTRS) list. 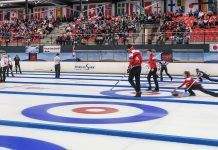 The list ranks curlers from across Canada, not just the teams in BC. The deadline to collect points was December 1, 2016. This is the first year that Curl BC has offered performance incentive funding. The four teams to achieve the funding were Team Morris, Team Joanisse, Team Thompson and Team Gushulak. On the men’s side, Team Morris, who ranked seventh on the CTRS list by the December deadline received $6,000. Team Joanisse, who ranked 25th overall received $3,000. On the women’s side, Team Thompson achieved a ranking of 13th overall to be eligible for $6,000. Team Gushulak received $1,000 because of their 28th position on the list. To find out how your team could be eligible for performance incentive funding, visit https://www.curlbc.ca/high-performance/about-the-program/.